The two vessels are of modern and high-speed version Spa 4207, designed for such operations as coastal patrolling, security protection, law enforcement and search and rescue. According to the builder, the ships with their reasonable designs require a low operational cost and facilitate service and maintenance while still meeting all international standards. Each is driven by two diesel engines with the capacity of 4200bKW (5632 bhp)/1600 rpm and can operate at the speed of 25.5 knots per hour. 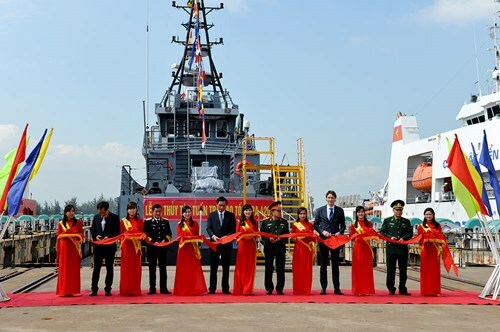 The two newly-built ships are part of the four-coastal-patrol-vessel contract between the shipbuilder and the Border Guard Command. According to experts, by signing the contract with a domestic shipbuilder, the Border Guard Force could save more than VND 400 billion for the Defense Budget while the force still has high-quality ships meeting all requirements of its missions.